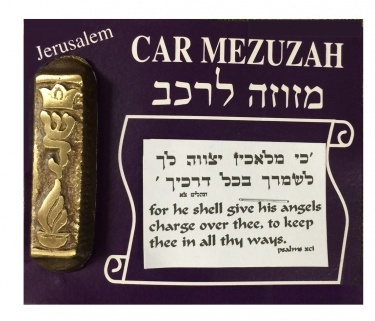 Brass Car Mezuzah from Jerusalem to affix to your car. Adhesive is attached. Comes with insert of Psalms xci. For he shall give his angels charge over thee, to keep thee in all thy ways. Written in Hebrew text. Made in Israel by Chen Holon Ltd. The Family owned Chen Holon Company was established in 1967. The company products line consists of Judaica products, Gifts and Souvenirs. The company specilized in custom made products. All products are all hand made, hand casted and hand finished by designers who brought their knowledge from their home countries.